All the cool kids will be in Jersey this weekend. 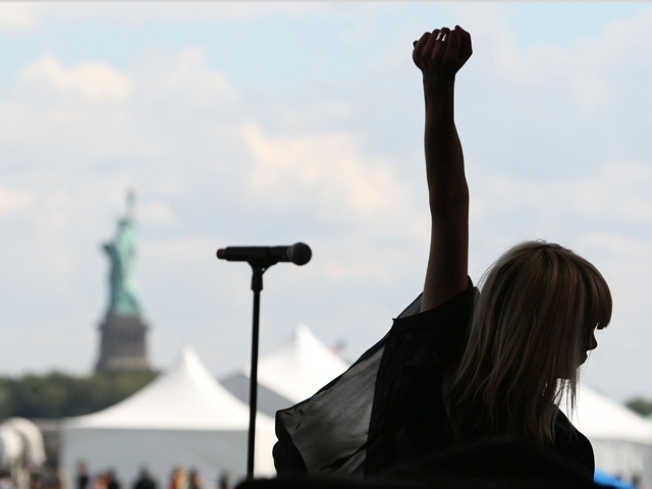 Singer Liela Moss of The Duke Spirit performs on stage with the Statue of Liberty in view during the last year's All Points West Music and Arts Festival at Liberty State Park on August 8, 2008 in Jersey City, New Jersey. This weekend, Jersey haters will have to kick rocks as the 2009 All Points West Music and Arts Festival descends upon Liberty State Park. The name All Points West pays homage to the droves of 19th century immigrants buoyed by New World dreams and newly shortened surnames who boarded trains at the Central Railroad Station to settle throughout the U.S. Fast forward a century later and the park is home to one of the biggest music festivals on the east coast with over 50 acts reveling in the shadow of Lady Liberty. Last year’s event headlined by artists such as Radiohead and Jack Johnson drew over 70,000 people. Organized by the same company that mounts California’s Coachella Music and Arts Festival, this year’s line-up includes marquee names such as touchy-feely rockers Coldplay, metal heads Tool, and Brooklyn dance-punk stalwarts Yeah Yeah Yeahs. The Beastie Boys were originally scheduled to headline the first day of the weekend-long festival but were sidelined by Adam “MCA” Yauch’s cancerous tumor which forced the group to cancel all of their upcoming shows. But the festival turned up a suitably hysteria-inducing replacement in Jay-Z who will make his U.S. festival debut after rocking shindigs like the UK’s Glastonbury Festival and Denmark’s Roskilde Festival in 2008. Last year’s inaugural festival featured a healthy dose of folk-rock and world music artists such as Amadou and Miriam, Spearhead, and Forro in the Dark in addition to high-energy dance outfits such as Girl Talk and CSS. This year, the earthy vibe has been dialed down in favor of a broader range of both emerging and established artists. Canadian DJs and producers MSTRKFT, proggy pop-rock duo MGMT, and synth-addicts Crystal Castles will rep on the dance tip. Lackadaisical rappers The Pharcyde, throwback hipster hoppers The Cool Kids, and former A Tribe Called Quest frontman Q-Tip will hold it down for hip hop. St. Vincent, Lykke Li, and Neko Case will ensure awesomeness for those who love quirky singer-songwriter broads. Comics like Janeane Garofalo and Michael Showalter have also been secured to bring the yuks. Looking to bypass the growing pains of the event’s first year, festival organizers promise a larger space, shaded areas, and some truly poppin’ beer gardens. In addition, ticket holders can zip over to the festival grounds for free on the Hudson-Bergen Light Rail Line while ferry riders will enjoy a reduced fare. Plus, patrons can rage for a cause since a portion of the festival’s proceeds will benefit “Friends of Liberty State Park,” an organization dedicated to keeping the area a free, green urban space. So, put down the Haterade -- at least for one weekend. "Mawuse Ziegbe is a freelance writer living, working, and looking for trouble in New York City. You can check out her music musings at www.giantstep.net/theresident"